Many a GURPS supplement offers piles of essential adventuring equipment, not to mention minor accessories and add-ons, and of course customization options. Such variety is a good thing – GURPS couldn't very well call itself "generic" and "universal" if it didn't cover every tech level well enough to support almost any character concept. Actions might make the hero, but hardware helps . . . and generic gear just won't cut it for the commando who knows his marks, mods, and exact ammo count, or for the swashbuckler who chooses his outfit as carefully as his blade. The catch? Endless wading through tech books. Gearing up means poring over at least one of GURPS Low-Tech, GURPS High-Tech, or GURPS Ultra-Tech, and perhaps two or all three of those . . . not to mention expansions such as GURPS Low-Tech Companion 2: Weapons and Warriors, and possibly specialized supplements like GURPS Bio-Tech. Customizing your PC's kit is great, but sometimes you lack the necessary time – and sometimes you truly don't know what equipment you need to do the job. 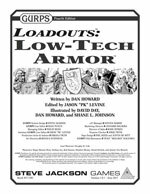 The GURPS Loadouts series aims to remedy this. Each volume delivers packages of ready-to-use equipment for characters who fill specific roles, whether that means kitting out a real-world soldier or gearing up to battle fantastic foes. These "loadouts" assemble all the stuff you need to play your part, complete with cost and weight totals, special notes and exceptions collected in one place, and useful advice on why you want that gear. They also provide thoughts on customization, so you aren't stuck playing a clone. Keep an eye on this page for quick-and-satisfying gift ideas for your favorite hero! New issues of Pyramid come out every month. Many contain gear, and some deliver entire loadouts. Where does gear matter more than in a dungeon full of traps to disarm, monsters to slay, and loot to carry home? The GURPS Dungeon Fantasy series offers its own collection of fantasy equipment sets – complete with ready-to-use equipment sheets – in GURPS Dungeon Fantasy 13: Loadouts. Ready to dive in and do it yourself? 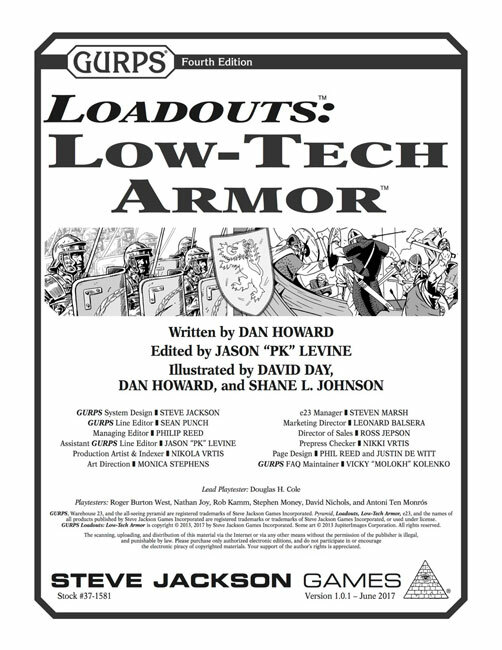 Heroes from TL0-4 settings will get great use out of GURPS Low-Tech, GURPS Low-Tech Companion 1: Philosophers and Kings, GURPS Low-Tech Companion 2: Weapons and Warriors, GURPS Low-Tech Companion 3: Daily Life and Economics, and GURPS Low-Tech: Instant Armor. More up-to-date adventurers will want to browse through GURPS High-Tech, GURPS High-Tech: Pulp Guns 1, and GURPS High-Tech: Pulp Guns 2 for all their TL5-8 needs. Futuristic gear can be found in GURPS Ultra-Tech and Transhuman Space: Shell-Tech. And GURPS Bio-Tech, GURPS Fantasy-Tech 1: The Edge of Reality, and GURPS Psi-Tech add specialized equipment for those whose view of "tech" isn't entirely conventional.